With all my enthusiasm for humanity's future in space, there's one glaring problem. We're soft meat bags of mostly water, and those other stars are really really far away. Even with the most optimistic spaceflight technologies we can imagine, we're never going to reach another star in a human lifetime. Reality tells us that even the most nearby stars are incomprehensibly far away, and would require vast amounts of energy or time to make the journey. Reality says that we'd need a ship that can somehow last for hundreds or thousands of years, while generation after generation of astronauts are born, live their lives and die in transit to another star. You know what's even easier? A wormhole; a magical gateway that connects two points in space and time with one another. Just align the chevrons to dial in your destination, wait for the stargate to stabilize and then just walk… walk! to your destination half a galaxy away. We'll use that classic demonstration from the movie Interstellar, where you draw a line from two points, on a piece of paper and then fold the paper over and jab your pencil through to shorten the journey. That works great on paper, but is this actual physics? As Einstein taught us, gravity isn't a force that pulls matter like magnetism, it's actually a warping of spacetime. The Moon thinks it's just following a straight line through space, but it's actually following the warped path created by the Earth's gravity. And so, according to Einstein and physicist Nathan Rosen, you could tangle up spacetime so tightly that two points share the same physical location. If you could then keep the whole thing stable, you could carefully separate the two regions of spacetime so they're still the same location, but separated by whatever distance you like. Climb down the gravitational well of one side of the wormhole, and then instantaneously appear at the other location. Millions or billions of light-years away. While wormholes are theoretically possible to create, they're practically impossible from what we currently understand. 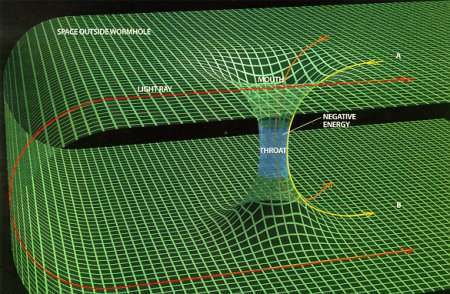 The first big problem is that wormholes aren't traversable according to General Relativity. So keep this in mind; the physics that predicts these things, prohibits them from being used as a method of transportation. That's a pretty serious strike against them. Second, even if wormholes can be created, they'd be completely unstable, collapsing instantly after their formation. If you tried to walk into one end, you might as well be walking into a black hole. There's a glimmer of hope, though, because physicists still haven't figured out how to unify gravity and quantum mechanics. This means that the Universe itself might know things about wormholes that we don't understand yet. It's possible that they were created naturally as part of the Big Bang, when the spacetime of the entire Universe was tangled up in a singularity. One possibility is that wormholes appear naturally like the virtual particles that we know exist. Except these would be incomprehensibly small, on the Planck scale. You're going to need a smaller spacecraft. Here's how it works. First, create a wormhole in the lab. 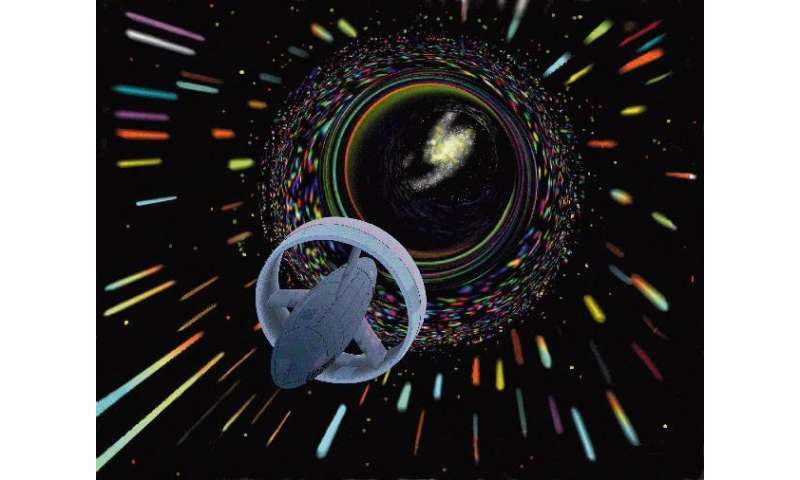 Then take one end of the wormhole, put it on a spacecraft and fly away at a significant percentage of the speed of light, so that time dilation takes effect. If you passed in one direction, you'd not only move the distance between the wormholes, but you'd also be transported to the time that the wormhole is experiencing. Go one direction and you move forward in time, go the other way: backwards in time. Some physicists, like Leonard Susskind think this wouldn't work because this would violate two of physics most fundamental principles: local energy conservation and the energy-time uncertainty principle. Unfortunately, it really seems like wormholes will need to remain in the realm of science fiction for the foreseeable future, and maybe forever. Even if it's possible to create wormholes, then you've got the keep them stable and open, and then you've got to figure out how to allow matter into them without collapsing. Still, if we could figure it out, that'd make space travel very convenient indeed. I read an obscure article someone had written accounting travelling on a UFO, and that they were able to "vibrate at the same frequency as the desired destination" and would instantly appear in that destination. Sounds far fetched, but there could be something to it, and possible easier to achieve than creating traversable holes in space time. We have to work with what physics will allow, not what we think it should allow. Its seems that travelling in this way requires entering another dimension, if only temporarily.